Regression in window handling when using Gnome Classic. 1. (multi-monitor) Place a window between first and second monitor. The window should not be forced back. 2. Place a window half-off the bottom of the screen. The window should not snap back up and there should always be a way to detach it from the bottom of the screen. Window placement in general, should be tested by manual/checkbox tests. The same commit has been well tested in Ubuntu 12.10. My screen is Nvidia Twinview setup and I'm using Gnome Classic with Compiz. I have found that since updating to 12.04 windows have two detrimental regressions. 1. If I place a window between the first and second monitor (so it overlaps both), the window is forced back over. I can understand this for off-screen windows but between-monitors is silly. And there should be an option for turning this off if there isn't one already. 2. If I place a window half-off the bottom of the screen, all hell breaks loose. Firstly it snaps back up so it's all on the screen (makes sense if you like that sort of thing), but after that, there's no way to detach it from the bottom of the screen. As soon as you do (and then click anywhere) it snaps back down so the bottom of the window is back at the bottom of the screen. The same is true with the top (if you move a window too high up (say holding alt and left-click-dragging the bottom up). I've found no way to work around this other than to close the window and start again, or restart compiz. The first is a dual-screen issue, the second might affect everybody; but they definitely seem related. I have tracked this down to the Place Window plugin. Disabling the plugin releases a window from its edge-captivity and while it's turned off future border clashes don't ensnare windows. That would be great if it wasn't so necessary. Compiz is near-unusable without it so that's only ever a temporary fix. And this is testing with the precise-proposed version, 0.9.7.6-0ubuntu1. It was the same before trying -proposed. Yes, turning off the Place Window plugin worked for me. Windows no longer spazz out when in-between workspaces, in-between monitors, or just not stritcly contained in one viewport in general. The downside is that now all programs that don't exlplicitly state a location to map the window at are placed at (0,0), which is annoying if you want to open multiple programs at once. I just wanted to confirm that this is happening on both by Nvidia TwinView desktop and my Intel 945GM laptop. Both of these systems are ubuntu 12.04 - amd64. Problematic behavior disappears after disabling the place plugin within compiz. After disabling this plugin remember that holding the alt key will allow you to move a window even if you can't grab the bar along the top. The worst impact of this bug for me is windows getting stuck to the top and bottom of the screen. After a window has touched either the bottom or top of the screen it will permanently be stuck there. I can drag the window away from the edge but the moment I release the mouse button the window will return to the edge. Moving a window to the left or right causes the mouse cursor to no longer match up with the window....This causes a certain degree of desktop flipping and window management havoc. I use a 4x1 (4 columns x 1 row) workspace layout so moving windows off the workspace left or right is different than moving them up or down. The attachment "fix-974242.patch" of this bug report has been identified as being a patch. The ubuntu-reviewers team has been subscribed to the bug report so that they can review the patch. In the event that this is in fact not a patch you can resolve this situation by removing the tag 'patch' from the bug report and editing the attachment so that it is not flagged as a patch. Additionally, if you are member of the ubuntu-reviewers team please also unsubscribe the team from this bug report. @Rock: thanks for your work, do you think you could do a merge request with your fix? I'm sorry because this is going to sound like a really silly question, but... can somebody explain how to apply the patch? Do I need the compiz source or can I modify the installed files directly? Thanks! Dàrent, yes you need the source code and knowledge of how to patch and compile code. You also need enough knowledge to be able to recover your system if you break anything. So I do not recommend digging further if you don't already know. It's too risky. Many people will also see bug 755842, which sounds very similar to this one. I haven not looked at this bug in detail but it sounds different simply because the place plugin is a factor. Thanks Daniel for your answer. You're right, I better don't dig more since I have now an stable system and this bug doesn't bothers me that much to broke it. I'll wait until it gets patched officially or somebody build a patched .deb. I also have that other bug 755842 witch I though it was unrelated so I just subscribed. I have the same bug, although my symptoms are slightly different than explained here. I had created bug #986063, but it was marked as a duplicate of this one. See Bug #986063 for a description of what happens to me. It only happens to me after a few days of my computer being on. Confirmed as a bug on my T61 Lenovo Thinkpad. Will this be fixed in 12.04 because it's an LTS, or will we have to switch to 12.10 when it comes out? guys, recently i switched from gnome fallback to XFCE4 and in XFCE4 i am using compiz without having this issue. place windows is working without this bug.so either u guys can wait for the fix or switch to XFCE4 as compiz is running nicely in with my nvidia card. can u explain how can i apply the patch..
Just to echo the others: an hour of testing in, and I've nothing but joy to report. This patch makes Compiz/Gnome-Fallback usable. Things behave as you would expect: windows aren't jumping all over the place or getting stuck, and, per the other bug, the panel isn't getting in the way of fullscreen applications. That should dump a whole collection of debs in `..`. After that just install the ones you need with `dpkg -i`. If you're using nvidia (pointedly the xorg-edgers PPA version) you might have problems compiling things that link to /usr/lib/libGL.so* so I just moved those files to my desktop, ran the `debuild -us -uc` command again and after that, moved the libGL files back. The bigger question is, how do we go about nominating this patch for immediate inclusion in Ubuntu so people aren't forced to download half a gig just to compile this in? Urgh, obviously the line `patch -p1 < ~/Desktop/fix-974242.patch` isn't supposed to look for your desktop - If you're following my instructions to the letter, just use `patch -p1 < ../fix-974242.patch` (or fix the path yourself). I'll try to keep up with the releases as they come in but this should do for initial testing. The patch fixes the issue of self-moving windows indeed. One exception: When moving a window from one display to another display (multi head setup), the window moves stubbornly. But I can live with that. Just want to confirm that is working perfectly here, I wasn't able to patch it myself so I'm using the provided ppa. This solves the fullscreen video issue (not only flash, any fullscreen app like video players), and also the problems with fullscreen applications running under wine with a dualhead (two monitors, nvidia, twinview). Also, it solves the problem of some applications with the fixed position plugin changing randomly from one desktop to another (vviewport). I'm using gnome-session-fallback with a little tweaking to make it load compiz directly from lightdm (skipping metacity wich is the default window manager for the fallback mode in gnome3). I believe patch supervisors are the ones who nominate a patch for release, but that hasn't happened in this case for some reason. This patch also nicely fixes another Place-Windows bug for me (https://bugs.launchpad.net/ubuntu/+source/compiz/+bug/1007976). I can confirm that the patch also fixes bug #1007976. Thanks! This bug and bug #862430 are the two bugs that are absolutely killing me with this version of Compiz. It would be nice to get a PPA setup that has both of the fixes attached until they can do an official release with the fixes. The fix for bug 862430 is available for testing in both precise (my PPA) and quantal (ubuntu updates, today). Please look at that bug for more details. Screen shots of what I was describing in post #2 of bug report 1017374. Anoter issue is the gnome pannels display themselves on top of the mplayer when mplayer is in full screen mode. I'm now sure this is a gnome-pannel issue rather than an mplayer one. 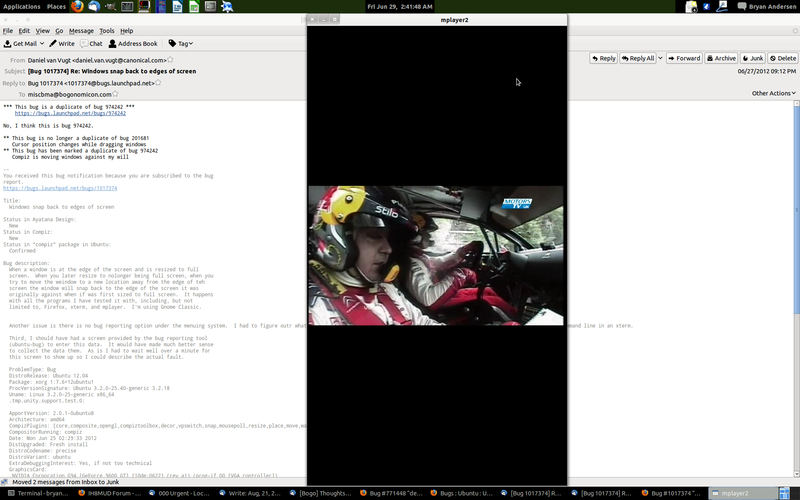 Image of mplayer with gnome pannels overlaying video when mplayer was put in full screen mode. Another window size snapping issue. When an mplayer window is resized off of full screen (using "f" full screen toggle command in mplayer) the window initially resizes like it did before, but then a fraction of a second later the top and bottom edges of the window snap to the top and bottom of the screen. 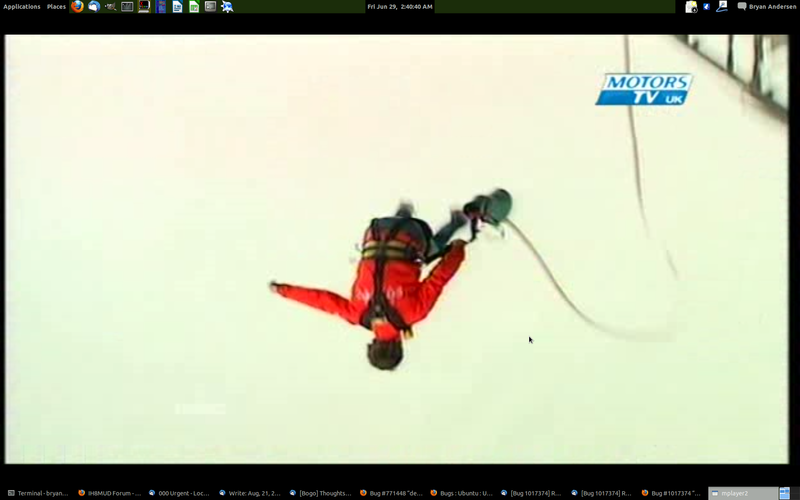 Image of mplayer after leaving full screen mode with top and bottom snapped to top and bottom of screen. I got the PPA installed, and it looks like all my window snapping issues were fixed by it. Last Compiz update breaks your fix. Is there some way to get this working again? I agree with @rawdmon (Post #30) - it'd be great to get both of these patches rolled up into ONE PPA such that they don't cancel each other out. Actually the flicker window bug patch has two minor issues, tearing when moving videos, and blank menus (right-click). Hi, can these patches please be pushed into mainstream Unity ... so that you DO NOT have to install from an PPA ? I am so happy to have the PPA! I believe this is related to BUG 1024591, and has a lot to with not neeing able to indepedently name each virtual workspace. Apparently this has been enabled upstream. currently this is not even in the top 20 bugs in term of heat in compiz (Ubuntu). I hope this bug (and other annoying ones like flicker on desktop switching or the broken default theme) gets fixed soon. IMO this is not admissible for a supposedly stable version. Sadly Gnome Classic in Precise is way too buggy, and 4 months after release there is not much indication that anything is going to be solved. I completely agree. And I have filed only 1/10 of the bugs I'm experiencing on Precise (most of them related to gnome classic but even not all). I'm really disappointed too - I was forced to upgrade from Maverick and the current #precise BUGGY situation is a HUGE pain. I would really like this in an official update. Luckily, it was easy enough to patch and build my own. I'd hate for the next update to break this for me. I guess I'll have to watch the updates as they come in. This creates an absolutely horrible experience and it was a HUGE deal for me. The workarounds are just as awful. This patch is IMHO vitally necessary to non-unity users. I was about 50% of the way towards deciding to dump Ubuntu and try Mint again because of this single issue. Patch works well for me too. I rely on a dual monitor for my job quite heavily, and it became increasingly annoying to work without the patch. Thanks to whomever fixed it (rockbuntu? ), I hope the patch makes it to an official update, especially as the patch is so simple! Thank you for the patch and ppa! I also noticed the odd behavior with windows near the bottom of the screen. The ppa also fixes a bug I was experiencing with maximizing windows moving out of workspace 2 to workspace 1 whenever I switched to workspace 3 or 4 using gnome-panel. knoxg: I followed your instructions to enforce the source of the compiz plugins to Oli's PPA. Everything worked as usual, but now I'm constantly getting a red triangle with an exclamation point that says: "The update information is outdated.This may be caused by network problems or may be caused by a repository that is no longer available.Please update manually by clicking this icon..." Any way to get rid of this? This seemed to have fixed it. Thank you! I've added Oil's PPA and can't seem to get the debs installed - the current version of compiz is now the same as Oil's PPA version - so no change. Issue is now back. I applied Oli's patch before, and it worked, but now the issue is back. It's as if the patch was undone in the past 24 hours. Save the file, close gedit. Used Oli's PPA, but this got broken again with today's routine update (on 12.04), so here's another vote to mainline it in the current release. Placing a window such that the majority of it is not on the current workspace, and then Alt+Tabbing to it, moves this window completely to the other workspace (where it's majority resides) and forces a workspace switch. This is independent of any window management plugin (snap, grid, place, ...). It's a behaviour I find fundamentally wrong. Compiz should leave my carefully placed windows (yes, not fully on workspace) alone, and certainly not force workspace switches. In which version of Ubuntu will this fix be released? The target versions are at the top of the bug. Compiz 0.9.7. * is for 12.04 and Compiz 0.9.8. * is for 12.10. - Updated AUTHORS from the full bzr log, and re-sort the list. gtk-window-decorator creates offscreen windows that are stacked on top. - Fix show-hud, bump COMPIZ_GNOME_INTEGRATED_SETTINGS_LIST_SIZE. Will be released an update for Ubuntu 12.04 (Precise)? The fix is committed to compiz 0.9.7.10 so that means it should be in the next compiz update for precise. However I do not know when that will be, sorry. From what I understand, the fix won't come to Precise unless this bug goes through the SRU procedure: <https://wiki.ubuntu.com/StableReleaseUpdates#Procedure>. Daniel: Would you be willing to do the leg work? Is somebody carrying out the SRU procedure? It would be fine to get the update as soon as possible because my patience is running out with this bug. This fix still isn't in 12.04. It is a mayor pain to deal with this every day. Could you please upload the fix to 12.04 asap? Thank you! The fix is now available at ppa:unity-team/sru, where the next 12.04 SRU is being prepared. Accepted compiz into precise-proposed. The package will build now and be available at http://launchpad.net/ubuntu/+source/compiz/1:0.9.7.8+bzr3121-0ubuntu1 in a few hours, and then in the -proposed repository. Just tested the package from precise-proposed - fixes the problem for me. Just tested the package from precise-proposed - It didn't fix the problem for me! Hi Kai. Is the problem you're encountering really the same as the problem here? Could you please give us more info about what is the current package version you are using? What hardware configuration are you using? All this info will help us find out why the patch fixed the issue for others and not for you. Hi, so sorry. Acutally it did fix the bug for me. Just one small thing is still not working (which is the point I tested with). When I use the Grid plugin to put a window in a corner, and than use a shortcut to move it to the other screen, it flips back to the original one. All the other flipping and moving around is fixed with this patch. Sorry for the confusion. * New upstream stable branch snapshot. conditions between gtk-window-decorator and the decor plugin. - Avoid a NULL dereference and give a useful error message instead. Thanks to everyone who worked on this. The only caveat is that with Window Place turned off (couldn't work with it on until this fix), new windows still start underneath the top bar. I guess that's a separate issue, but still. I'm getting behavior similar to what Kai reported. When the grid plugin is used to place a window, it snaps back to the original position, making the grid plugin useless for many use cases. For instance, if I want a window on the top 1/3rd of the screen on one of my monitors, the easiest way used to be to press ctrl-alt-kp8, and then make it a little smaller. That no longer works: it snaps back to being half the screen. Is there a bug open somewhere for this behaviour?